RATON – Thanks to a collaboration between the Department of Game and Fish, Colorado Division of Parks and Wildlife, Vermejo Park Ranch and the U.S. 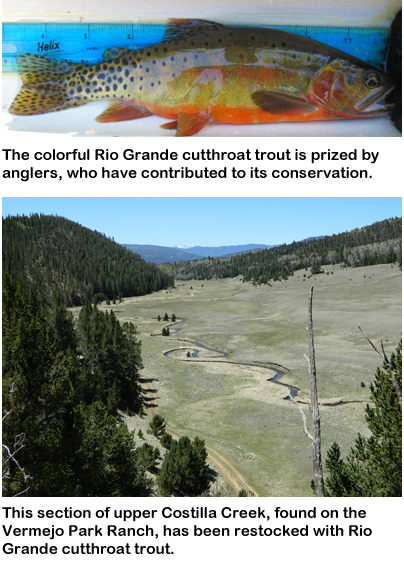 Fish and Wildlife Service, the Rio Grande cutthroat trout will have protected habitat long into the future. A Candidate Conservation Agreement with Assurances (CCAA) for Vermejo Park Ranch, recently approved by the U.S. Fish and Wildlife Service, will help conserve and restore the New Mexico State Fish and other native fish in the Costilla watershed. The Department works closely with private landowners, states and federal agencies to recover sensitive species and their habitat. By proactively agreeing to conservation activities within a project area, a CCAA can protect existing uses such as agriculture, recreation or commercial activities if a covered species becomes federally protected. “We have been working together for 10 years to make sure we can address the needs of the Rio Grande cutthroat trout and other native fish living in the watershed, while ensuring private landowners continue to be able to manage their own lands. This agreement does that,” said Department Fisheries Chief Mike Sloane. The Rio Grande cutthroat is easy to recognize with its red throat slashes, rosy belly and spotted sides. Anglers have long enjoyed the colorful fish and have contributed millions of dollars to conservation and habitat restoration for the species through the purchase of fishing licenses and fishing equipment. At Vermejo Park Ranch, non-native trout were removed and Rio Grande cutthroat were stocked. Non-native trout will continue to be removed from the waterways until the restoration is complete. Because of the CCAA, the Costilla basin is set to provide important habitat for New Mexico’s native trout for many years to come. Although not listed as endangered, the Rio Grande cutthroat trout is a candidate species for federal protection under the Endangered Species Act. The Department is working hard to keep the fish off the endangered species list by increasing the subspecies’ range and the number of populations through habitat restoration and stocking. Currently, Rio Grande cutthroats are found in about 10 percent of the species’ historic habitat, which encompassed the Rio Grande, Pecos River and Canadian River basins in New Mexico and Colorado. The species faces many challenges, including non-native fish, fragmented populations, drought and poor habitat.